2 Bedroom, 1 Bath. Sleeps 4 in Beds. Cozy. Amenities. Active Community. Cozy cabin in center of nature with hiking & biking out the door. 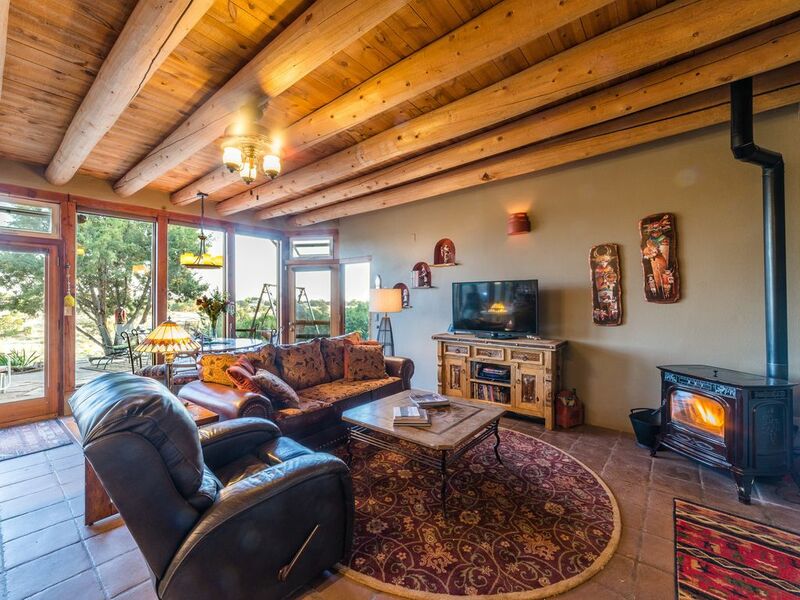 Quientiscential Santa Fe style with vigas, latillas, adobe, cedar beams & countertops, and rustic decor. Tranquil and inspirational--- 20 full length windows inspire work during the day; while the bucolic setting allows peaceful respite and unmatched stargazing at night. Upscale community with restaurants, shopping, dog parks, equestrian center & trails, elementary school, library, summer pool, and Senior Center. Comfy king bed and fireplace in Master Bedroom inspire romance and relaxation. Master overlooks an enclosed courtyard, which provides a secure area for furry friends. Artistically decorated second bedroom with twin trundle bed accommodates children or travelling buddies. Original artwork and furnishing, with fully stocked kitchen. Cabin inspires romance for couples, adventure for small families and pets, creativity for artists, and productive workspace for business travelers. Dual showerheads in combo shower/tub. Sit-down vanity separate from sink. Magnificent overhead natural light, peaking through Southwest latillas via a 10 ft skylight. Separate ventless Air Conditioning in all rooms. Separate ventless heating/air in all rooms. Both bedrooms with decorative electric fireplaces that do produce heat as well. 100% cotton, 600+ thread count sheets, down comforters. Custom Southwest decor. Full size Whirpool Front load washer, behind accordion door in bathroom. Laundry essentials provided. Full size front-load Whirpool Dryer, behind accordion door in bathroom . Electric fireplaces in each bedroom. Parking right next to cabin entrance. Very large detached garage. Normally not accessible to guests---more practical to park right next to cabin. However, can be used if needed for storage, or if vehicles temporarily need protection. Wifi. Satellite service from Hughes Internet. Plenty of large, fluffy towels. Thermostat regulated Pellet Stove, which burns wood pellets. Appearance of fireplace, but much lower maintenance and definitely more efficient. Also, much more hypoallergenic than even central heat. Jenn-Air stainless steel french door with dual pull out drawers. Filtered water and Ice (crushed/cubed) in door. Induction Range. Exceptional for high altiitude cooking. Convection Oven, with warming drawer below. 800 watt. Simple and easy to operate. Both Keurig and Thermal Drip 10 cup. Salts, peppers, and virtually every spice sold (>40). Basic cooking supplies such as oils, vinegar, sugar, flour, baking soda/powder, teas, coffee. Plenty of service ware for 4-10. Kids ware. Cutlery, crockpot, large/small pots & skillets, popcorn maker, blender, bakeware, wine/beer/martini/highball glasses, & Soda Stream for seltzer. Fun! Very large kitchen for size of cabin. Exensive cedar countertops allows the most elaborate cook/chef ample room for creativity. Very open to living area, with outside views of Greenbelt. Table seating for 4. Counter seating for 2. Bar seating (bench) will seat 4. Outside dining table with 4 chairs, but will easily accommodate 6. Mutiple guide books on New Mexico, Santa Fe area. Also cookbooks and magazines. Spacious flagstone patio, with expansive views of Greenbelt and Sangre de Cristo Mountains. Glider. Comfy/cushioned papasan swing for 2. Separate enclosed patio next to Master Bedroom. One level, stamped concrete floors. Not technically ADA compliant, but suitable for those with some mobiity impairment. Community of Eldorado with large outdoor pool from mid- May to late September. Cozy with lovely views and wonderful hospitality! We had a wonderful week at this home! Beverly is generous and helpful. The home has every amenity you might need.... and more! Truly, there's nothing missing here including the spectacular view. We didn't want to leave. Don't delay! If you're considering visiting the area, book this home now. If you don't it is likely we will! Beautiful view--sunsets were spectacular! Everything was provided--even drinks and snacks upon arrival. We lacked for nothing. Hiking trails were right out off the patio. The only glitch we had was the overhead light coming on in the master bedroom in the middle of the night. The owner said an electrician would be called to investigate the matter. Also, be aware of coyotes in the area. One wondered up to the patio area, and they can be heard howling at dusk. Stop at Cafe Fina for lunch and dessert! It's just off the interstate exit (north). A great place to relax and escape the insanity of the noisy everyday world we live in yet close enough to all of that to be able get right back in the race again. Beautiful nature sounds day(great bird song) and night(coyotes singing you to sleep). Super comfortable beds and just all around amazing place to just hang out. Probably the best equipped and appointed living space we've ever stayed and we've stayed in many places. Pictures can't do this place justice which may be a cliche but once you experience this place, you'll see. Best Vacation Rental I Have Ever Stayed In. I cannot say enough positive things about Beverly and Phil's wonderful home. This was by far the most enjoyable VRBO/home rental experience I have ever had and we travel a lot and have rented a lot of places around the world. 2) The house is FULLY stocked with every possible amenity and extra you can think of. Spices, shampoo, conditioner, toilet paper, paper towel, dishes and glasses, towels, blankets, etc etc. etc etc. You know how most rentals have like 2 rolls of toilet paper, 1 roll of paper towels, and maybe some salt and pepper? Not here. You will want for nothing. 3) Beverly and Phil are super nice and will answer every question you can think of. Beverly especially was very attentive and quick to respond to any text. 4) The patio in the back is awesome. It has a comfy swing for two and set of table and four chairs for dining, a grill, and many bird feeders. We watched more hummingbirds than I have every seen in one place at one time. Sunsets on the patio with a glass of wine were perfect. 5) The BED was amazingly comfortable, we slept like rocks every night. A solid 8-9 hours ,which is just crazy for us. 6) We played tennis (two courts) every day. The courts are like brand new, pristine condition and only a 4 minute drive away. You literally cannot go wrong staying here. I would come back in a heartbeat. We loved this place so much, we stayed for 5 full months! The perfect place to get away in Santa Fe! It’s secluded, yet only 20 minutes from downtown. Everything about the place says to simply relax and enjoy yourself while you watch nature every morning from the patio. We loved it so much during a week stay in December 2017 that we booked the place for 5 months in 2018. What an amazing time we had at this home. It’s fully furnished and we lacked nothing. The owners were amazing and always there when we had questions. When I arrived, there was a gate I was not expecting but I reached Beverly by phone and she walked me through what to do. Then she graciously gave me a "virtual" walk through by phone explaining important info. She obviously cared about my comfort and getting familiar with my home for three weeks. Beverly was so unconcerned about my Great Pyrenees, a large dog. It was wonderful to have such a welcome for BOTH of us. The house was very clean upon arrival and once I had all of the shades open, the magic of New Mexico came streaming in the windows. I have previously lived in the area and have considered moving to Eldorado so I chose this location instead of prior Santa Fe vrbos. What is special about this home is the floor to ceiling windows that provide clear, full views of the open space, sky, and mountains. The patio is well-furnished and a lovely place to enjoy relaxing outside. No need to even walk outside for the spectacular sunsets or moon, and even stars could be seen inside! My dog and I walked every morning and afternoon by simply stepping off the patio and enjoying the trails in the open space. Eldorado also offers trails through 5,000 acres of a private, Eldorado preserve, so for hikers it doesn't get any easier and the house had a map plus other area info. The home was very comfortable, supplied with everything I needed, a well-stocked kitchen, and a short drive to Santa Fe. It is a passive solar design and primary heat is the pellet wood stove. I had to call Beverly about the pellet stove since I was unfamiliar and could not find instructions. My only suggestion is to provide a book with instructions about items that we went over by phone. It only took a day or two to figure out what combination of shades, wood stove, or open door I needed for a comfortable temperature. There is no real need to leave Eldorado since it has a grocery, post office, some shops, music venue and restaurants. Oasis Cafe has fantastic gyros and Cafe Fina is excellent for everything from coffee drinks, to baked goods, to breakfast and brunch meals. Wifi was good, as was Verizon cell service and I used the smart TV to rent a couple of movies through my VUDU account. I appreciated Beverly checking with me a couple of days after I had time to settle in. She is very thoughtful and had some local beverages in the fridge to enjoy. I recommend this home for anyone seeking a pet-friendly, pleasant home with expansive views and a thoughtful, open-minded owner.